I flew home from Paris last Sunday, and as I write this, I'm still a bit jet lagged. One of these days I'm sure I'll get back to a normal sleep schedule. I now seem to rise at 4:30 every morning–at least it gives me time to write. 1. Potato chips. You gotta love a country that is as obsessed with potato chips as France. Nearly every bar or cafe brings you a little cup of them with your wine or Orangina (my new obsession). It's offering a little something extra–a habit we writers would be wise to emulate, don't you think? Take the time to go deeper, to go back and rewrite that scene you've never quite been able to get right. Take the time to give a little extra in your writing and your life. 2. Fantastic wines from the Languedoc Roussillon region. Oh man, we loved the wines from the area we stayed in. (It was the south of France, but very close to Spain. Big Catalan influence with many signs in both languages.) What can I say? Setting is important. Bring yours to life with details from the location you're setting your story in. 3. Water follows a natural course. 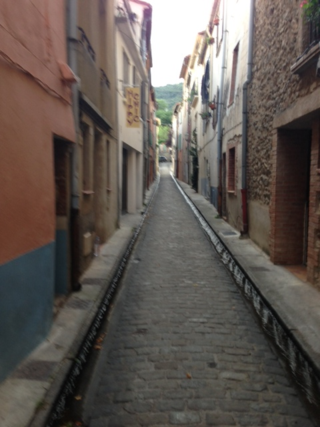 In Ceret, the sides of the narrow, cobblestones streets have gulleys in which water flows all day and night. (See photo above.) The sound of running water and church bells chiming the hour (starting at 7 AM–no sleeping late there) are a constant backdrop. 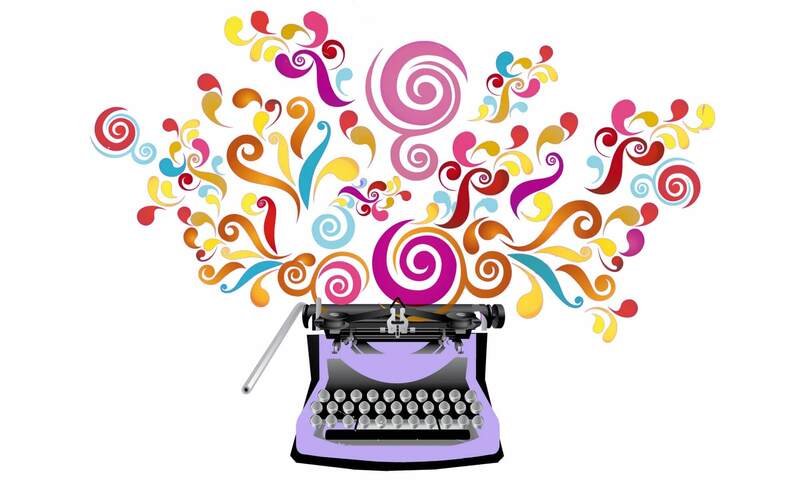 Hopefully, your writing flows, too. It does when you just let it, go I've learned. And it doesn't when you force it. that I just got up and admired the vista. 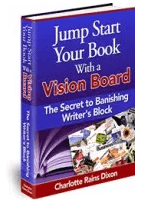 You will get writer's block at some point, too. My advice? Quit resisting and go with it. Take a break. Refresh yourself. You'll get back to the work, trust me. 5. French women do have more style. They just do. And I think its because they make an effort to put their best selves forward in every situation. Even if they are running to the corner boulangerie, they pay attention to what they're wearing. Do me a favor, would you? Check over your manuscript one more time before you send it out to anyone. Make sure its formatted correctly (double spaced, please) and that there are no typos. I've seen a lot of manuscripts lately wherein the writer seems to have forgotten this crucial step. Put your best self forward. 7. In Ceret, there's a boulangerie on every block. (Kinda like there's a coffeeshop on every corner here in Portland.) Every morning, I'd take a walk and swear I would not return home with chocolate croissants. I'll leave it to your imagination to decide how successful I was. But this baked goods abundance made me think about ideas, and how we live in a rich stew of them. An idea on every corner! And many more in between. We just have to become aware. 8. Tourist areas are fun–but many other areas offer delights as well. I traveled through Paris on my way to and from Ceret. My first couple of nights in the city, I stayed in the home of a wonderful woman named Diane (this was where I had the amazing view of Paris). I rented this place through AirBandB.com. On my way back, I stayed in a fancy hotel on the Champs Elysses (thanks, Marlene). Two very different experiences. Is there a different area of your creativity you'd like to explore? Painting? Line dancing? Fiber arts? Head off the beaten path and see what you create. 10. All roads lead to Perpignan. We took the bullet train (that baby really is fast) from Paris to Perpignan, which is a bit of a hub. It's where Salvador Dali reputedly had a psychedelic experience that led him to declare that Perpignan was the center of the universe. This may well be true. As we were out and about on the countryside, we discovered that no matter which direction we traveled, there would be a sign saying we were on the road to Perpignan. For me, this is true of writing as well. All roads lead back to my writing. All experiences, everything that happens, are reflected in my writing one way or another. I wouldn't have it any other way. What about you? Does travel, foreign or domestic, inspire you? What exotic locale would you most like to visit? ***The above photo was taken by moi. I had planned to add a bunch more images to this post, but major wonkiness is going on with Typepad and photos. I took tons of pictures, some blurry, some crooked, some actually halfway good, and you can see them all on my Instagram stream.